Petrus shows the letter from ROS affirming him as the party president. KUCHING: Peace Party may contest in the coming 14th general election despite skipping this year’s state election. Party founder and president Julian Petrus Jout said this will be done if there is favourable support for the party in seats eyed by its aspiring candidates. “He or she should register himself/ herself at the party’s office before going to the ground where he/she intends to stand for during the election,” he said yesterday. 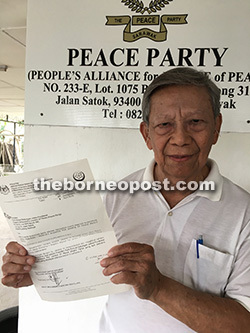 Peace Party was one of the five new parties registered in Sarawak by the Registrar of Societies (ROS) but the party did not take part in the 13GE in 2013 and the state election this year. Petrus, who founded the party, also claimed it now has around 1,000 members who have subscribed to the party’s multiracial concept. He said he registered the party to be a third force in Sarawak after leaving PBB where he was an active member in Bau years ago. He added the party’s aims were among other things, for Sarawak to get 50 percent royalty in oil and gas, as well as for the government to appoint a minister in charge of non-Muslim affairs and rights. On another matter, Petrus said a letter received recently from ROS director general Datuk Mohammad Razin Abdullah confirmed that he was still the party president. He said ROS had completed a probe on the party following a complaint on leadership tussle, and the result of the probe reaffirmed Petrus’ position as president of the party. “The main reason for the probe was due to various disturbances caused by a former secretary general who have resigned on his own accord from the party. The said individual had then continuously created difficulties towards members of Peace Party and caused confusion to members of the public. “We are glad that such disturbances have finally come to rest,” he said. Petrus was referring to former secretary general Pok Ungkut, who had claimed to be Peace Party president before the state election. Pok contested in the May 8 state election as a candidate from PBDS Baru in Balai Ringin, which involved a four-cornered fight that was eventually won by incumbent Snowdan Lawan from BN-PRS.